This form is required to be posted on all used motor vehicles before being offered for sale; it contains a signature line with a required disclosure. 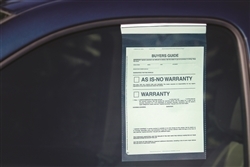 Shrink-Wrapped This form enables the dealership to disclose a known material damage to a vehicle prior to sale/lease, provides information regarding said vehicle and confirms the customer was advised of the damage prior to signing the retail purchase/lease agreement. Shrink-Wrapped This form contains a complete vehicle description; provides the ability to integrate all material understandings/documents; states dealership obligations, rights and remedies; states customer obligations, right and remedies; contains warranty statements and disclaimer language. This folder provides easy storage of all documents associated with the sale, assists dealer in making sure that the transaction was completed properly, provides dealer with necessary information about the vehicle and customer. 100 Count This folder provides easy storage of all documents associated with the sale, assists dealer in making sure that the transaction was completed properly, provides dealer with necessary information about the vehicle and customer. 100 Count This form is required to be posted on all used motor vehicles before being offered for sale; it contains a signature line with a required disclosure. Shrink-Wrapped This form is required to be posted on all used motor vehicles before being offered for sale; it contains a signature line with a required disclosure.